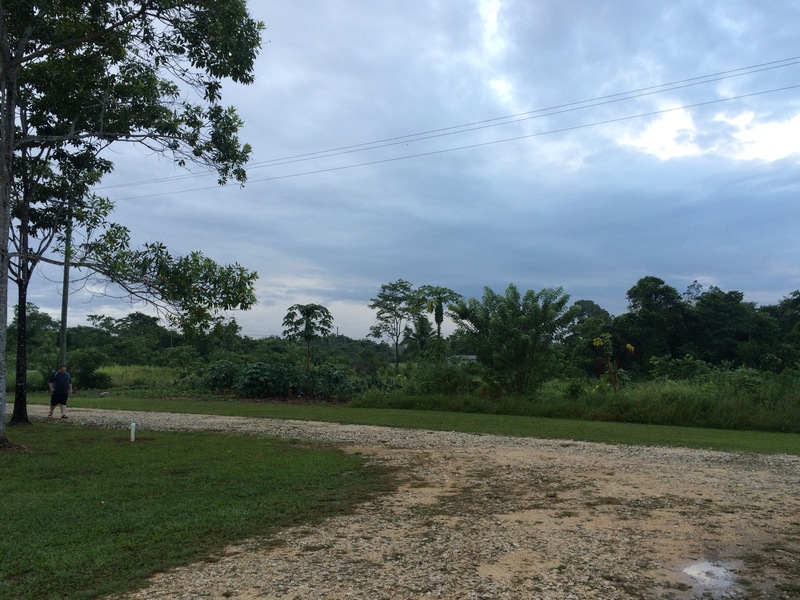 Each morning I’ve stepped on the deck of the Belize Training Center facing the east, waiting for the sunrise. It’s offered a lesson each morning in my prayer time. First, one of our Pastors is on the deck as the first [apparent] riser of the day. It has given me a reminder of the foundation of our church life and the spiritual leadership of my church home as well as our home, home. This pastor reminds me of my husband in some ways and the ways he is not has given me a new appreciation for the manner in which my husband has gently led our home spiritually by his example. Daily, David reads his bible but never used words to tell Sienna and I we would be wise to follow his example. Pride– the ugly side of myself that often times sounds as if I think I am the spiritual leader at home– yet, who’s faith walk can be a poor example to unbelievers. I’ve had reminders on this trip to keep my pride in check as well as my insecurities. Both can inhibit God’s work. Back to the horizon– yesterday I took this picture but did not post. It was a renewal day and my spirit was spent. We pondered and pampered. I did not post. Yesterday’s horizon lesson was on perspective. The sunrise looked much like the day before. I was a little bummed to not have a shiny new insight to share. 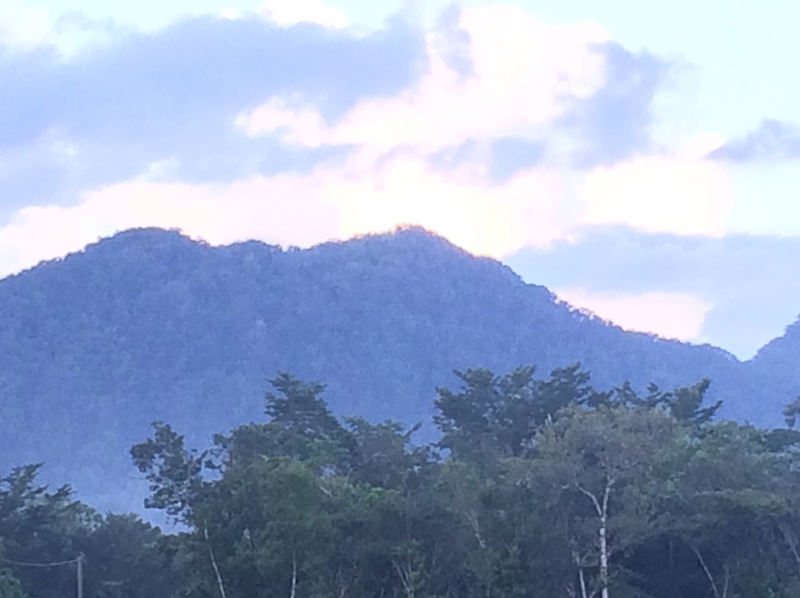 So I took a few steps to my right and saw the mountain in the distance. It looked grand! I love mountains and hope to live one day with mountains within my view. 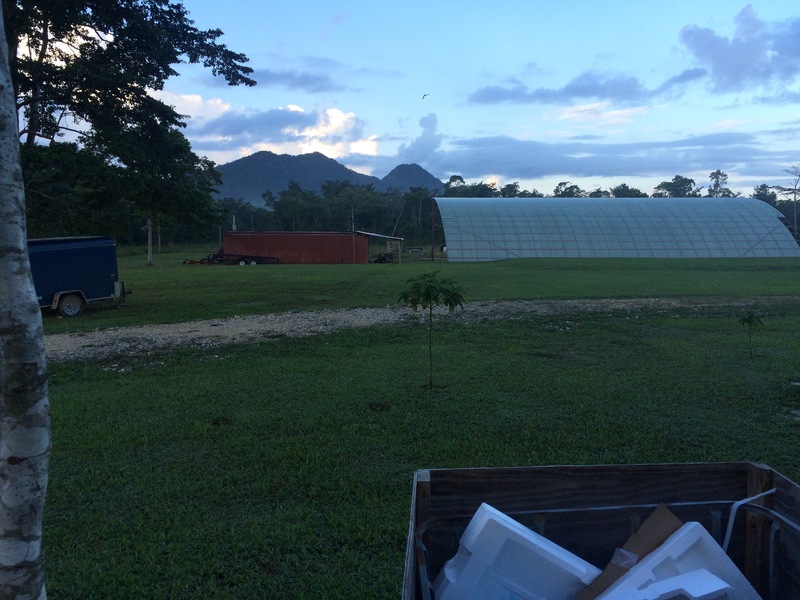 I took out my phone to snap a photo but had to zoom in to crop out what was around… The compost pile, the garbage bin, the shed, and the incredible greenhouse that is under construction. Truly, the mountain isn’t as magnificent unless you see it in perspective of what is around it. Life is much more meaningful, more educational if we can change our perspective and our focus. So what was today’s lesson? They will bring respite from the heat. They will bring rain to nourish the crops and hydrate the people. They will change people’s plans to do something different than if the sun was shining brightly. How often we have productive days when the rain keeps us indoors. The reality is, the sun is still shining behind the clouds just like God is still present even though we cannot see Him. If I were to get in an airplane today, I would have the ability to rise above the cloud cover to see the sun [Son] shining. I love to fly for this reason and more. Obviously it takes me places I could not get to on my own. I could, but it would take me longer. I wouldn’t have to walk, I could drive. They often say driving in a car is more risky than air travel yet that doesn’t assure the person who is struggling with anxiety to fly. The reflection I often have when taking off in an airplane is how quickly we have evolved from the Wright Brothers first flight. This is another blog reflection in itself. As I raised the camera to take my photo, our senior pastor came into my view. A wonderful assurance that we have solid, God-honoring leadership with us. Traveling with some of our pastors has been enlightening. It’s easy to feel intimidated but also encouraging to see their human side. None of us is perfect and we won’t be until the other side of heaven. The bible is filled with examples of imperfect people used by God. There was only one man who was perfect and that was Christ. Each of our pastors directs us to One True God when we walk together in our humanity. The intuitive, introvert Pastor who feeds me spiritually needs the mentor pastor who stands FIRM on Biblical truth. Having this opportunity is a precious gift from God. More on that later as I continue to write, impacted forever by this journey.